Stroehlein unclasped the cigarette case and laid it open. For a moment, Paul forgot everything. Gold gleamed inside the silver, a thin leaf no bigger than a book of matches. The letters were so tiny you could barely make them out. He wondered how anyone had ever managed to write it – or why they’d felt the need. Twelve golden tablets sit in collections around the world, each created by unknown hands and buried in ancient times, each providing the owner with a route to the afterlife. Eleven of the tablets are held in museums; only one remains in private hands. Paul Mitchell, a penniless graduate student, knows who has it. And he's about to find out there are people who will pay any price to get it. Twelve tablets sit in collections around the world. Each has gone on its own journey, and each has its own story to tell. Taking place a few months before The Orpheus Descent, this is one of those stories. 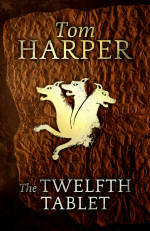 You can download THE TWELFTH TABLET for 99p from Amazon.co.uk.